Ok so what is this EMI stuff and why do we need EMI shielding? Well Electro-Magnetic Interference results from RF emissions from electronic devices. These emissions radiate outside the device where it disturbs the operation of other electronic equipment. With processors running at increasingly faster frequencies and over all systems running faster, there exists a greater chance of other devices interfering with your computer system. The result would be an unstable system. Many people blame the OS (Windows) or faulty software/hardware for unstable systems, but an unstable system might actually be caused by poor EMI shielding. Everyone and their mom has a cell phone these days. So you have all these signals traveling in the air that can potentially cause interference with your system. A good case with EMI shielding will pretty much protect the rest of your system for any undesirable effects. I mean don't get me wrong, it's not like your system is going to be crashing all the time without proper shielding but you're just increasing your chances of system instability. SP has gone great lengths to ensure the Silent-PC is properly shielded. The side panels are lined with patented EMI-Liner spring contacts that guarantee shielding up to 5.2 GHz outgoing and 2 GHz incoming. These spring contacts are built to last and stay elastic for the life of the case. So you can open and close your case without losing any shielding quality. The EMI shielding continues from the external drive bay shield to the interface card slot shield. You can rest easy knowing the case is fairly safe from any outside interference. In addition to the EMI shielding, the case also has a slew of features that make it more than just your average case. First let's talk about the case construction. It is very solid and well constructed. The case I have is black (really dark gray) and the paint quality is superb. They use prepainted sheet metal which offers more scratch and UV resistance. It definitely doesn't look like an amateur paint job that's for sure. The front bezel has an optional slider that covers the external drives and switches. This slider comes in several colors and can be locked with the front panel lock included with the case. So let's take a look inside this thing. The noise reducing features are quickly apparent when you open up the case. The side panels are lined with foam to reduce noise, and the hard drive rack has a ceramic enforced rubber lining to reduce noise from vibration. The foam padding is also anti-static and heat conducting. This keeps the system protected from static as well as not acting as an insulator. The power supply is a 250w Quiet Technology power supply that is built to be silent. The fan inside can barely be heard when the system is running while still working effectively. This power supply is new and has only recently been offered with the Silent-PC case. It is AMD certified so it should be enough to accommodate most single processor systems. However, if you have multiple drives, processors, and interface cards, you might run into a problem. For the average user 250W should be adequate but you never know. I personally just ran into some power supply problems with my 400w Antec PS which I laid to rest after only 9 months of use. Of course, you could always just put your own power supply in there. For quiet and high output, Enermax has their Whisper series of power supplies. The case is also packed full of usability features. The side panels don't need screws but instead they have a sliding mechanism that holds them secure and not to mention the springs lining the edges. The panels can be a little hard to remove and install at first but the more you do it, the easier it gets. The foam makes it a tighter fit and little more difficult to install the side panels. The expansion card slots use a tool-less installation mechanism that makes it very easy to install any PCI/AGP cards. You don't need to bring out the screw driver for this. 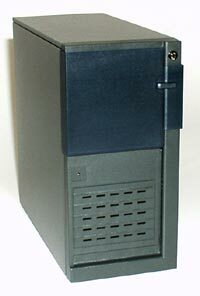 The CD-ROM and floppy drive racks are constructed so that you only need to screw in one side of the drives in. The other side has a spring like lining, similar to the side panels, that hold the drives in place. This supposedly reduces the stress on these drives while still keeping everything secure. Either way it makes for easier installation because you don't need to put screws on the other side. The case also comes with a slide out motherboard tray which makes it very easy to install your system. It also doesn't need screws to slide out but is locked in place by the hard drive rack. The position of the hard drive rack is notable because most hard drives are located in front of the case. This one is located in the back actually near the exhaust hole. The case also has an optional extra hard drive cage if you need more space and also an exhaust fan. The estimated price reflects the price that I found a reseller offering it for. It is rather pricey for a mid-tower case, but with all the features packed into this case, it's worth it. I'll cover how everything else falls into place later in the installation section. Introduction/The Company/What Is The Silent-PC? Is It Really Quiet?/Is It Cool?